The renovation of London?s Portman Square continues apace with the deep, compressed air aeration of lawn areas immediately adjacent to 15 ancient London Plane trees. Suffolk based Terrain Aeration were called in to treat the 50ft high specimens under contract to Garden Link, the main contractors in charge of implementing the new improvements specified by York landscape architects The Landscape Agency. quality of the square in keeping with the location.? The privately owned square, a ?Communal Garden? covering one hectare was created in 1754 and re-instated in 1953. Having been used to grow vegetables during the war, the space subsequently suffered bomb damage, and according to Garden Link?s MD, Dan Flynn, the space has hardly been maintained for the last ten years. The lawns were holding water, and there was a lot of moss,?he reports. ?I don?t think there had been any spiking done on the grass and I doubt if the shrub beds had been dug.? Terrain Aeration, working at two metre spacings, covered as much ground as possible, approx 3,000 sq metres during their one-day hire. 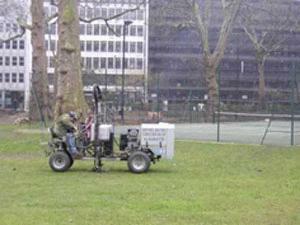 Using the company?s Airforce machine they injected compressed air at up to 20 bar, one metre down to create underground fractures and fissures beneath the grass and around the feeding roots of 15 Plane Trees. Dried, milled seaweed was injected on the final air blast, which will swell on contact with moisture and keep the air channels open. The entire scheme, scheduled to be completed by the end of May this year includes the re-planting of the shrub layer, extensive tree surgery to lift the canopies and allow more light into the garden, as well as the addition of colour and interest to the four gateways. ?We?re resurfacing the footpaths, re-edging the lawn areas, and installing lighting and irrigation systems as well as replacing children?s play equipment and repairing and repainting the two pavilions,? continues Steve Heward. ?The object is to create an appropriate flagship for The Portman Estate, and to provide an attractive open area for the resident key-holders.? Terrain Aeration is expected to return to the square this autumn to treat areas currently obscured by landscaping activities.